Kingston, the independent world leader in memory products, has added 4GB and 8GB capacity sizes to its family of DataTraveler 2000 encrypted USB Flash drives. The smaller capacities join the existing 16GB, 32GB and 64GB models, and are all FIPS-197 certified. All DataTraveler 2000 drives offer 256-bit AES hardware-based encryption and PIN protection with access through an onboard alphanumeric keypad. DataTraveler 2000 drives are designed for global security IT professionals, small-to-medium businesses and corporate end users who require data protection in a USB. As the drives are OS independent (compatible with any device with a USB 2.0 or USB 3.1 Gen 1 port), they are easily deployable in work environments where multiple devices and operating systems are in use. Each drive is protected with 256-bit AES hardware-based encryption and no software or hardware drivers are needed. 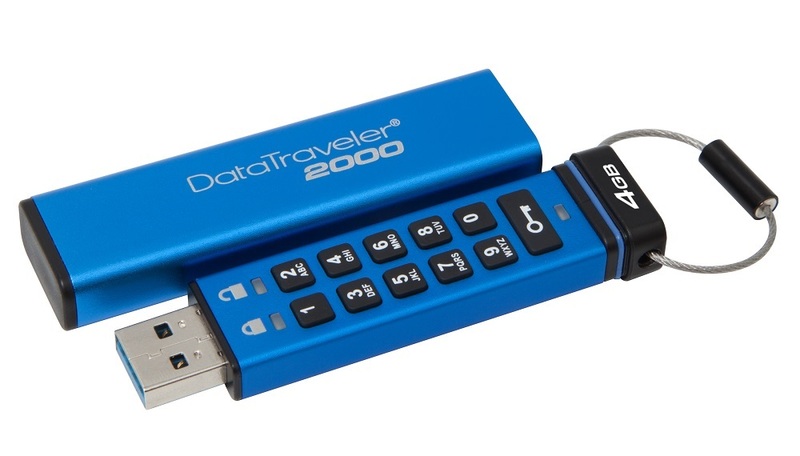 DataTraveler 2000 features an alphanumeric keypad which allows users to lock the drive with a word or number combination for easy-to-use PIN protection. A full-drive reset (whereby the existing data is deleted and a new password is required) occurs after 10 invalid login attempts to lessen a brute force intrusion. For additional security, an auto-lock feature is activated when the drive is removed from the host device even if not properly shut down before ejection. Since early 2016, Kingston has been the proud owner of the entire USB technology and assets of IronKey, a long-time leading brand in encrypted USB Flash drive solutions. Kingston continues the IronKey brand and tradition of delivering FIPS 140-2 Level 3 certified solutions to customers who need the highest level of encryption and security. With the IronKey brand, Kingston demonstrates its commitment as the global leader in trusted encrypted solutions for mobile data. DataTraveler 2000, as well as Kingston’s full line of encrypted DataTraveler and IronKey USBs, is backed by a five-year warranty, free technical support and legendary Kingston reliability.